Ludwig van Beethoven was born on this day in Vienna, Austria in 1770. Today is the 242nd anniversary of his birth. 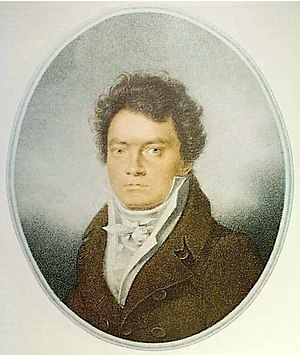 He was the eldest of the three surviving Beethoven children. His father taught him the violin and clavier. 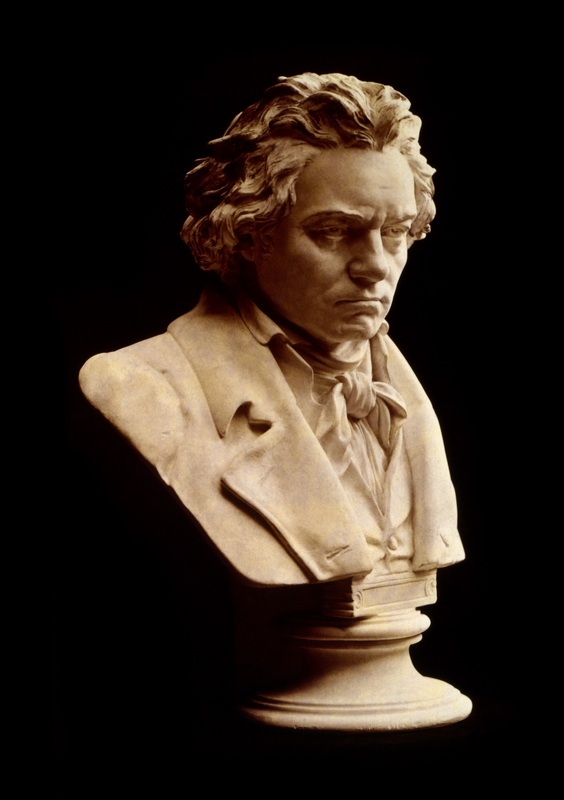 The elder Beethoven was an alcoholic and a draconian teacher, “Beethoven was flogged, locked in the cellar” [Biography], beaten if he played a wrong note, and deprived of sleep so he could practice. The boy had his debut with a public performance in Cologne in March 1778. His father shaved a few years off his age so Ludwig’s talents made him seem more of a child prodigy. At 10 he left school and began to take lessons on the organ and in composition from Court Organist Christian Neefe. Neefe was a much better teacher than his father and he introduced the boy to a world outside the scope of music, including philosophy. By 12 he published his first musical piece, 9 Variations in C Minor for Piano. When Beethoven was 14 Neefe recommended Beethoven as court organist for Maxcimmian Franz of Cologne. At 17 Prince Maximilian sent him to Vienna to meet Mozart, but returned home two weeks later upon hearing that his beloved mother (who he called his best friend) had become severely ill. Heartbroken, he stayed in Bonn for several years. He took over the care of his younger brothers — his father had sunk further into alcoholism and was no longer contributing to the family. In 1790 he wrote a musical memorial in honor of the death of Emperor Joseph II. Here’s the Soprano aria with Judith Howarth and the Corydon Orchestra. He went back to Vienna at 22 and studied with Haydn, Salieri and Albrechtsberger. His skills as a virtuoso pianist helped him win patrons among the Viennese aristocracy. His composing allowed him to highlight his piano playing skills. In 1795 he performed and published his Opus number 1, three piano trios. His Sonata quasis un fantasia (aka Moonlight Sonata) and the ballet The Creatures of Prometheus came next. He was transitioning from Classical world to the Romantic world. He followed the ballet with his Symphony No. 3, The “Eroica Symphony” which he originally wrote in Napoleon’s honor. Here’s the first movement as played by New York Philharmonic, conducted by Leonard Bernstein. 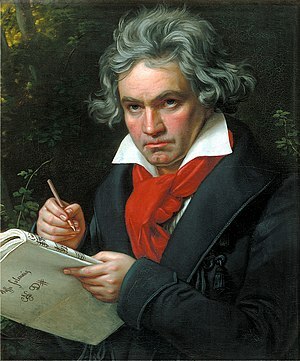 By 26 Beethoven had begun to loose his hearing. He could not hear from the persistent ringing in his ears. He stopped attending social functions and moved to Heiligenstadt, a small town outside of Vienna. Tenaciously he continued to compose, producing “an opera, six symphonies, four solo concerti, five string quartets, six string sonatas, seven piano sonatas, five sets of piano variations, four overtures, four trios, two sextets and seventy-two songs” [Ibid] in his heroic or Middle period. He kept conversation books where friends would writing down what they were talking about to keep him in the loop, and he would respond orally (and sometimes would respond on paper.) He had about 400 of these books, but only 136 exist today. His late period includes the Missa Solemnis, String Quartet No. 14 and his infamous Ninth Symphony. Beethoven died on March 26, 1827. He was 56 years old. This entry was posted on Monday, December 17th, 2012 at 2:45 pm	and posted in Europe, Music, postaday, Thought of the Day, Today's Birthday. You can follow any responses to this entry through the RSS 2.0 feed. Listening to Led Zeppelin or the version of “Since I’ve been loving you” off Page and Plants Unledded brings tears to my eyes! Ludwig said – Music should strike fire from the heart of man, and bring tears from the eyes of woman. They can bring a tear to my (very masculine) eye.